If you are a business owner out there today, there are all sorts of considerations you must constantly weigh and whether or not to purchase a commercial dry steam cleaner may not be at the top of that list. However, it may be far more important than you realize. Employers are always on the lookout for ways to lower the cost of doing business while maximizing profits. They want to do this without sacrificing quality or losing sight of running their business the right way. Commercial dry vapor steam cleaners provide a quick, simple solution toward those ends. They provide an effective and efficient cleaning option that both sanitizes and saves money for the business. For the past 40 years or so, businesses have been benefiting from the technology of dry steam. These units are commonly used in the food service industry, labs, government installation, hotels, and anywhere where cleanliness and germ free environments are important. Dry steam is called dry because it is heated to such a high temperature that most moisture has been removed and you are instead dealing mostly with water vapor. 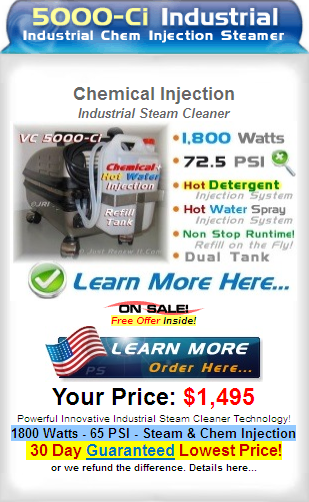 In fact, high quality industrial steam cleaners have been measured to produce steam that is less than 5 percent water. Those same high temperatures also work to help clean and sanitize. With temperatures around 200 degrees Fahrenheit, it is hot enough to actually break the molecular bonds between different surfaces and the dirt and grime on them. That makes these devices excellent to clean burners, stoves, hoods, vents, ceilings, and overs as it will quickly and easily dissolve grease. These units are also commonly used for sanitizing food prep areas, vats, machinery, and conveyor belts. For those who are responsible for cleaning freezer and refrigeration units, the power of dry steam industrial cleaners can be used to clean these units out without having to power them down and wait for them to defrost. The commercial dry vapor steam cleaners that are producing a steam that is 5 percent or less wet are excellent to use around various types of machinery. Because of the low moisture content of the steam, they can be used to clean and sanitize limit switches and sensors, different control, moving parts, and remove particles from press tools. While areas can be difficult for people to reach with rags and traditional cleaning agents, the pressurized steam can reach into those areas. Where business owners need to be concerned with oxidization on assembly and sliding tables and other components. The oil grooves, plate tables, and other assemblies can be hit with the dry steam and not cause oxidization. These machines can also be uses around electrical systems whereas other cleaners could short out electrical systems. Many business owners also use commercial dry vapor steam cleaners to clean and sanitize rest rooms. The steam helps to sanitize and deodorize toilets and urinals. It can also help to scour tile and grout, especially when you use a metal brush attachment. Many have found the usefulness of an industrial dry vapor steam cleaner in sanitizing furniture and upholstery. This is one of the few ways that have been found that can kill bed bugs and their eggs. These units allow you, the business owner, to provide a safe and healthy working environment for your employees as well as for your customers and vendors. For one, you end up with the ability to clean your office, warehouse, restaurant, or any other type of business. Most germs and bacteria are killed by the time temperatures reach 160 degrees Fahrenheit. This is very beneficial, because so many people pick up colds, flus, and other illnesses where they work. If you, as a business owner, can lessen the chances of people getting sick, that means you are spending less. How? How much time do your employees need to take for sick days? How much work is lost or how slow does it get on those days when employees need to call in sick? What if you could eliminate the excessive sick days your team needs to take? People are still going to fall ill now and again, but you could definitely lessen their need to do so as often. At the same time, you can stop wasting money on the various cleaning agents and detergents your business has tried and relied on for years when you invest in a commercial dry vapor steam cleaner. Those chemicals come in bottles and packages that mean more waste from your business. At the same time, using the chemicals creates chemical spillage and run off. A dry vapor steam cleaner ends up meaning more green cleaning solution for your business. Those expensive, and often ineffective, cleaners you have been buying for years also have a chance of causing a variety of side effects. Employees, vendors, and customers could be sensitive to the specific chemical compounds used in the cleaners. They could feel light headed or otherwise ill due to the aroma. They could have a skin reaction. They could even have an allergy reaction to the cleaners you try to use to make the work environment cleaner and safer. Think about it. A lot of these cleaning agents have written instructions to use only in a properly ventilated area or to wear special protective equipment. You can avoid these problems by simply investing in a commercial dry vapor steam cleaner for your business. So, it cleans better and ends up saving money by not using chemicals, but why else would you want to use a commercial or commercial steam vapor cleaner for your business? Well, imagine having a healthier environment for your employees. Attendance issues can be improved upon, because people simply are not getting sick as often. At the same time, with the proper attachments for the vapor steam cleaner, you are also providing ways for staff to clean areas faster. Areas that may have been hard to reach before can be easily gotten to with the jet of steam. Plus, there are a variety of attachments for scrubbing and agitation. So, you are reaching more areas and making it easier for your people to clean things. This means your cleaning team can work more efficiently and that means that you can save money that way as well. 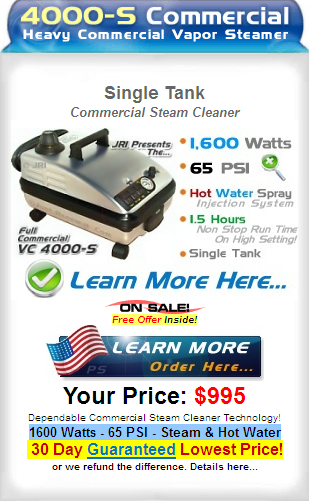 Which is the best commercial dry vapor steam cleaner for me? One of the biggest things to remember, however, is if you look at the cost saving potential of an commercial dry vapor steam cleaner, you need to be sure you are buying the right model. For one, make sure it is a quality dry vapor steam cleaner built for businesses. This is not something you can run down to the corner home goods store and pick up. Typically, you are going to need to order it and often you can do this directly from the manufacturer. The cheap consumer models have several components made of plastic which will break down and wear over time. The commercial and commercial steam cleaners have mostly metal components which are made to stand up to more regular and heavy use and last for many years down the road. They also reach higher temperatures, so the sanitization is complete. The consumer models offer little steam in most cases and produce more water. This is simply just not as effective or efficient. It is not as clean and all that excess water can be problematic, encouraging rust. So, once you realize you will be selecting a quality commercial dry vapor steam cleaner, there are still a number of items you need to look at. How many and what kind of attachments are available for the unit? Does it come with any attachments? What is the warranty like? If the unit needs serviced, how does the repair work for the unit get handled? You want to look at all the options and features of the unit. 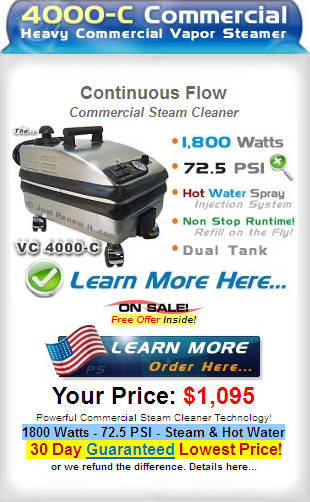 Does it have a water tank or is it a continuous flow commercial steam cleaner? Does the unit you want have the option for a detergent tank for those really big and stubborn jobs? Speak with your commercial dry vapor steam cleaner’s supplier about these sorts of things before making any final decision.